Poor Thomas Hendricks. The man served as Grover Cleveland’s vice president for only a few months, from March 4, 1885 to November 25, 1885, before dying of natural causes in his sleep. 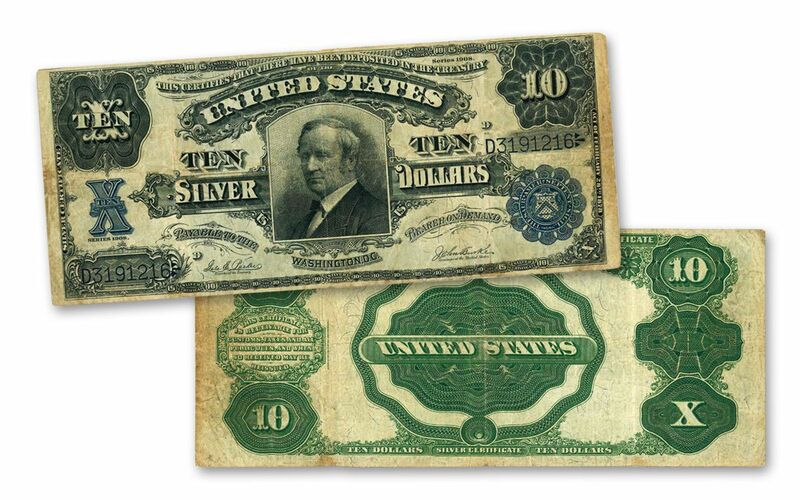 Less than a year later, a $10 Silver certificate was issued that featured his portrait. And, in what may NOT have been an accident, the artists at the Bureau of Engraving and Printing framed him in what appeared to be a tombstone. Besides prompting some initial claims of poor taste by a grieving public, the design also led to these certificates being nicknamed “Tombstone Notes” – a moniker that was destined to forever overshadow the former Vice President depicted on its surface. As it turns out, this story isn’t just sad, but spooky as well, since the design and even production of this certificate began before Hendricks passed away! First issued in 1886, the design was issued again in 1891 and 1908. Hendricks remains the only vice president who did not serve as president whose portrait appears on U.S. paper currency. The intriguing history behind this note has led it to being listed as #85 in Q. David Bowers’ book 100 Greatest American Currency Notes. 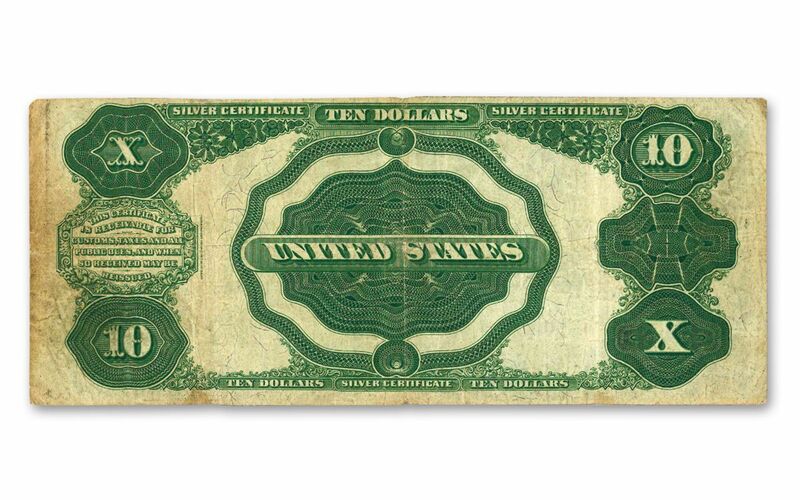 Here’s your chance to make the famous $10 “Tombstone Note” part of your collection with this scarce note from the 1908 Series. 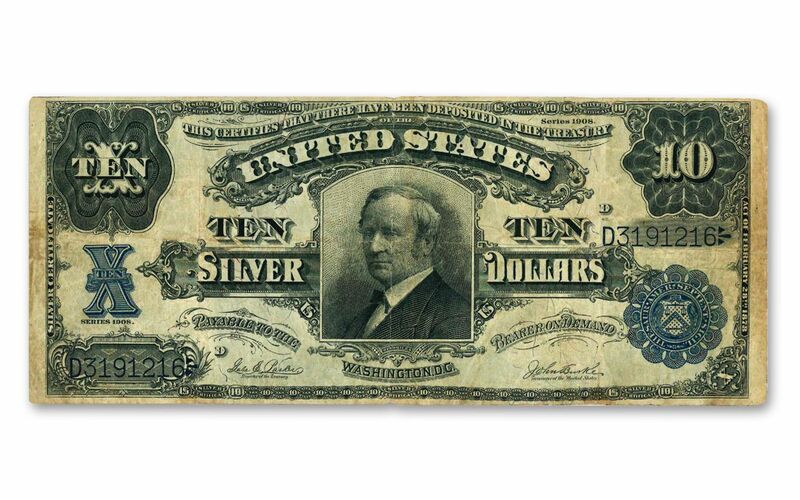 This 1908 Tombstone Silver Certificate features a stark blue seal, roman numeral “X” and serial number, which contrasts well with the rest of the dark, ornate design. Best of all, you can obtain this coveted note in Very Fine (VF) condition housed in a clear acrylic holder and accompanied by a certificate of authenticity. Thomas A. Hendricks (1819-1885) was a popular politician from Indiana who served in both the United States House of Representatives and the United States Senate. He was also Indiana’s 16th Governor before being elected as the nation’s 21st vice president. Unknown to most people, however, was the popular Democrat’s poor health. Hendricks suffered a paralytic stroke in 1880, and while he was able to return to public life, he could no longer stand for any length of time. No one outside his family knew of his health issues and with his popularity unblemished, Hendricks ran as Grover Cleveland’s running mate in the 1884 Presidential election. Serving less than a year as vice president, Hendricks died unexpectedly during a trip home to Indianapolis. The vice presidency remained vacant after his death until Levi P. Morton assumed office in 1889 following the election of Benjamin Harrison as the nation’s 23rd President. Share the story of this eerily prophetic piece of numismatic history and secure yours today!